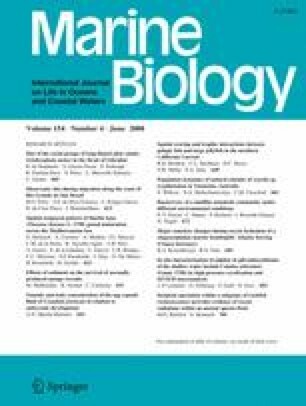 The aim of this study was to identify potential environmental controls of the asexual phases of reproduction by measuring the rates of asexual reproduction (budding and strobilation) and mortality in naturally occurring populations of Aurelia sp. scyphistomae at different spatial and temporal scales. The percentage cover, density of colonies of Aurelia sp. scyphistomae, and density of the population of two naturally occurring colonies of Aurelia sp. scyphistomae were examined over 2 years in southern Tasmania. Artificial substrates were also deployed to investigate colony dynamics when density dependent effects were reduced. Clear spatial and temporal differences in the population dynamics of the colonies were observed. Density dependent effects controlled budding and recruitment of new scyphistomae to the substrate when populations were dense and space limiting. In contrast, environmental controls of budding and strobilation were more apparent in a colony with significantly greater area of bare substrate and hence room for expansion. Water temperature and rainfall (as a proxy for salinity) were linked to changes in population size. Annual and seasonal differences in population dynamics were not observed in a colony limited by space but were apparent in a colony where space was not limited. When space was removed as a limiting factor by deploying artificial substrates, a seasonal environmental effect on the rate of growth of the colony was observed. These studies suggest that the growth, survival and reproduction of the sessile colonial phase of Aurelia sp. is regulated by a combination of density dependent factors and environmental conditions, which are consequently important to the formation of jellyfish blooms. We thank the initially four, and after amalgamations, two salmon farming companies, Tassal Ltd and Huon Aquaculture Pty. Ltd for their financial support, sharing of information and logistical support on the water. This research was funded by an Australian Research Council Linkage grant to C.M.C and N.A.M.